Our CO: How should historic land be redeveloped? The 72-acre Loretto Heights area is in for a major redevelopment. The former school campus, located at the intersection of Federal and Dartmouth, has been empty for more than a year. It was sold in July to a Denver-based developer, focused on revitalizing the area. DENVER -- The 72-acre Loretto Heights area is in for a major redevelopment. The former school campus, located at the intersection of Federal and Dartmouth, has been empty for more than a year. It was sold in July to a Denver-based developer, focused on revitalizing the area. “We expect this to take about nine months to a year and develop a community consensus on what would best serve the neighborhood,” said Denver District 2 councilman Kevin Flynn. The area has a long history. 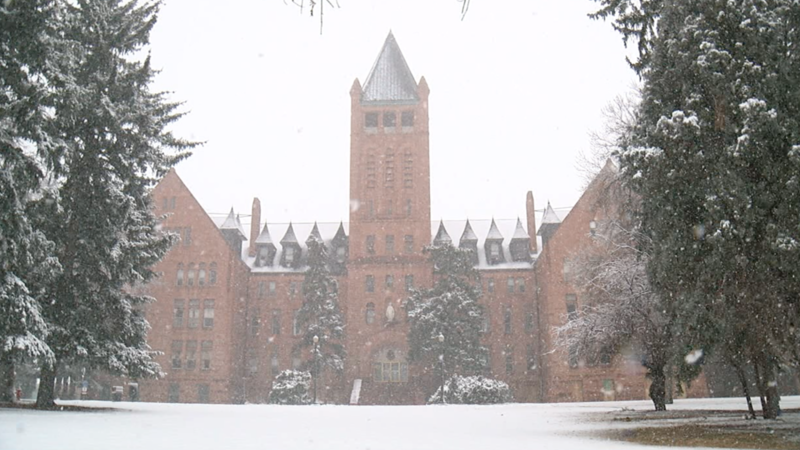 The iconic red sandstone administration building first opened its doors in 1891 as Loretto Heights Academy, run by Catholic nuns as a girl’s school for decades. The school even served as a training ground during World War I. “The Sisters of Loretto had a performing arts curriculum that was pretty well renowned around the country and they built a facility... I just don’t want to see us lose here in southwest Denver,” Flynn said. In 1988, the school shuttered its doors and the campus was transformed into Teikyo Loretto Heights University, a college focused on educating international students. In 2009, it went through a name change and became Colorado Heights University. Part of the land was leased (and eventually sold) to Denver Public schools in 2012 to house the Denver School of Science and Technology. In 2016, the president of Colorado Heights announced the school would close for good after the 2017 fall semester. The challenge now is balancing the need to preserve some of the historic buildings with the desire to re-imagine the area. “There are also some great historical buildings on there and they’re in the middle of doing a historical assessment on the entire campus,” said Flynn. The development group, Westside, agreed to hold off on developing the area until the community is given a chance to weigh in. Some of the buildings, including the original administration building, bell tower and chapel will stay and be preserved. Flynn says the developer is also trying to determine whether the old theater can be saved. The cemetery where 62 nuns who taught at the school were buried will also be preserved. “It will be a revered spot, it’s a spiritual spot, in fact the founder of the campus is buried there, Sister Pancratia,” Flynn said. Other than that, the area is up for redevelopment and could eventually include apartments, retail space and some open space. Flynn says he’s already started to hear from some of his constituents about what all of this change will mean for the area. Many are also worried about big buildings moving in and dramatically changing the skyline of the area. “Denver is changing every day and change is good, but some things need to be left alone. Here is historical land,” Johnson said. That’s why the city and the developer are hosting a series of community meetings to hear from the public about how they would like to see the area used. On Saturday, the developer met privately with a nearby neighborhood association to talk about the future of the space. This Tuesday, it will hold a public meeting for the community to weigh in and also ask questions. “We hear what people don’t want an awful lot in this business but here’s your opportunity to tell us what you do you want,” Flynn said. Tuesday’s community meeting will be held at 6 p.m. on the campus. Flynn said he distributed more than 10,000 pamphlets to people in the area to encourage them to come out. “Frankly, what we seen in southwest Denver is low levels of involvement and we been beating the bushes trying to get people to come out,” he said. The group is also planning on doing the meeting once again entirely in Spanish in the coming weeks. “I think this will be a real jewel for southwest Denver when it’s completed whatever it ends up looking like,” Flynn said. The city is hoping to have a vision for the area by the end of the year and the developer plans to start breaking ground in 2020.